SAP is the world’s leading business software solution and e-business platform. SAP solutions are incorporated, configurable, open and scalable. They work for every type of business, sustaining and streamlining the operations of international enterprises, mid-market companies and smaller role players, delivering competitive benefit whether business processes are difficult or comparatively easy. SAP gives your business a backbone of core functions, from financials through manufacturing and sales and delivery, to human resources. It offers the ultimate in visibility of management information across your business and the tools to enable it to play an active role within the e-business world. Your investment in SAP is protected over the long term. Whilst each initial SAP solution can be customized to the present requirements of your business, the basis is laid for the system to be modified and extended in line with its development through time. Ongoing, considerable investment in the technical development of the software and the amalgamation of best business practice to enhance functionality, combine to offer the most powerful and flourishing business platform accessible globally. SAP solutions presently come in 4 different flavors: SAP Business One, mySAP All-in-One , mySAP ERP and mySAP Business Suite. These solutions are designed to meet the needs of all sizes and types of organization. The solutions are all completely integrated and it is possible to integrate each type with the others. SAP Business One is a simple, integrated solution targeted at small and mid-market organisations, and particularly those using relatively straightforward or a limited number of business processes. The solution offers standard functionality to meet your needs – there are no unnecessary extras or industry-specific options. Businesses benefit from a high degree of integration between functions, access to e-business functionality, the ability to leverage any existing IT infrastructure and rapid implementation. SAP Business One allows even the smallest of companies to benefit from seamlessly integrated operations and collaborative relationships with third parties – at low cost. mySAP All-in-One is designed to meet the needs of small and mid-market businesses, and specifically those with sophisticated business processes and ambitious development plans. Whether you are currently running multiple best-of-breed packages or looking to replace a poorly integrated business system, mySAP All-in-One offers you the benefits of enterprise resource planning traditionally enjoyed only by larger companies - in an affordable way. Implementation is accelerated due to the pre-configured nature of the solution and the availability of ‘best practice’ templates designed for specific industries. The system’s integral training environment facilitates rapid user familiarisation in preparation for access to the productive system. These two key factors combine to allow visibility of early, positive results from the system and help to attain a quicker return on your investment. The mySAP All-In-One solution includes the key functions needed to support the business, including financials, human resources, supply chain management and customer relationship management, plus a selection of e-business applications. mySAP ERP has been developed by SAP with the emphasis on collaborative processes and improved control. It incorporates recently updated functionality in Financials, Human Resources, Operations (covering purchasing, sales, production, logistics and maintenance) and Corporate Services (covering functions such as estate and travel management). In addition, it includes completely new and sophisticated analytics capabilities and Strategic Enterprise Management (SEM). mySAP ERP represents the new generation of enterprise level software from SAP. Incorporating release 4.7 (the upgrade from 4.6c), it is the successor to the highly successful mySAP.com. It incorporates all the elements of its predecessor but adds the benefits of additional functionality in the form of new layers of integrated tools. Included with this release are some key new areas to enable total business integration. These comprise built-in analytics to enable managers to query areas of the business without the need for customised reports, including SEM (Strategic Enterprise Management) and Financial, Workforce and Operations analytics. In addition mySAP ERP has been enhanced with Corporate Governance, Financial Supply Chain Management, Employee Relationship Management and Environmental Health and Safety. mySAP ERP is underpinned by Netweaver technology, and Web Application Server replaces BASIS. This is now SAP’s entry-level global enterprise software solution, as release 4.7 is only available to existing SAP customers. Significant benefits include new efficiencies, greater integration, lower total cost of ownership (TCO) and reduced time to return on investment (ROI). mySAP ERP incorporates SAP R/3 Enterprise (or SAP R/3 release 4.7) and is powered by SAP NetWeaver, the comprehensive integration and application platform. mySAP Business Suite is a truly comprehensive range of solutions and, in essence, an updated and more powerful release of mySAP.com. It includes mySAP Business Intelligence (essentially the latest version of Business Information Warehouse – or SAP BW), mySAP Customer Relationship Management (CRM), mySAP Enterprise Portal, mySAP Mobile Business, mySAP Product Lifecycle Management (PLM) and mySAP Supply Chain Management. This is the more comprehensive version of mySAP ERP. Based in the same way as mySAP ERP on release 4.7 and underpinned by Netweaver, it also incorporates many of the products which are optional extras with ALL the other SAP products. Hence in addition to all the new functionality that ships with mySAP ERP, mySAP Business Suite includes the mySAP Solutions for CRM (Customer Relationship Management), SCM (Supply Chain Management), PLM (Product Lifecycle Management), SRM (Supplier Relationship Management), Enterprise Portal, Business Intelligence, Mobile Business and Marketplace. This unbeatable combination makes MySAP Business Suite the most comprehensive ERP solution in the market place today. It is unlikely that this will be surpassed by any of SAP’s rivals in the foreseeable future. It offers the same significant business benefits as its smaller sibling with industry specific capabilities and unlimited scalability. You can choose a single solution from the suite or implement all of them. mySAP Business Suite is also powered by SAP NetWeaver. NetWeaver is SAP’s revolutionary technology platform which simultaneously integrates business processes and information from both SAP and non-SAP systems and exploits Web services technologies. NetWeaver is fully interoperable and allows developers to employ a range of technologies, such as Microsoft’s .NET, IBM’s WebSphere and Sun’s Java, to build applications combining information from multiple system sources. NetWeaver supports portal and mobile applications, business intelligence and knowledge management. It incorporates SAP Business Information Warehouse, SAP Enterprise Portal, SAP Exchange Infrastructure, SAP Mobile Infrastructure and SAP Master Data Management. If you’re wondering what happened to SAP R/3 and mySAP.com, these solutions are still available - but only to existing SAP customers. The latest release is 4.7 – also referred to as SAP R/3 Enterprise. This release is an upgrade from SAP R/3 4.6C and incorporates new features and functions, including Internet facilities. SAP R/3 Enterprise also incorporates SAP R/3 Enterprise Extensions – functional enhancements in the areas of Financials, Supply Chain Management (SCM), Product Lifecycle Management (PLM), Human Resources and Travel Management. SAP R/3 Enterprise is based on SAP Web Application Server – which is common to mySAP ERP and mySAP Business Suite. 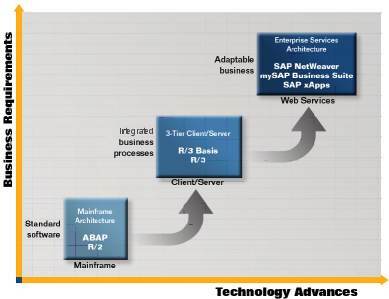 SAP Web AS is key to the development and implementation of Web applications and services. It is the backbone of all the mySAP products and comes with NetWeaver.